I’ve now been in Jerusalem for less than 24 hours, and those 24 hours have been quite a whirlwind. I began my journey from Rosh Pina, the nearest station to Hazor, at 5:15 pm Saturday with a ticket bound for the Jerusalem Central Bus Station. This was the easy part; I was able to find all of this information on the Internet, and it worked out well: I was on the first bus after the resumption of transportation services following Shabbat, and it gave me plenty of time to unwind at the kibbutz before heading south. And the ride to Jerusalem was magnificent. 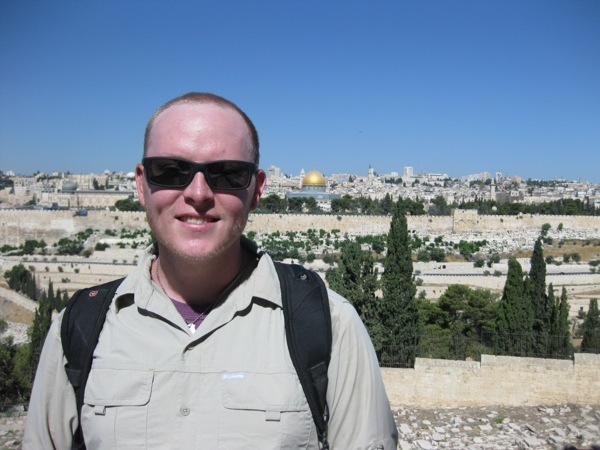 Jerusalem, the Old City, that I eventually got to! Read on. Once off that bus, however, I was terrifyingly on my own, with no idea of where to go. Actually, that’s not totally true. I knew I didn’t want to take a taxi, as I haven’t had the best luck with taxis so far on my trip. I always feel ripped off by them, and taxis can’t go into the Old City anyway. So I figured out from my travel books that the best drop-off location around the Old City would be Damascus Gate, and that the walk from there to the convent wouldn’t be very bad. Now as far as I could and can still tell, intracity bus information for Jerusalem is not available on the Internet, so I assumed it would be rather easy to get to Damascus Gate once at the Central Bus Station. Not so! My first instinct, anyway, was to follow where the crowd went to some other bus platforms. When we got to what looked like more buses, I asked the guy at the bus information station, who couldn’t have cared less about being of helpful service, which bus would take me to Damascus Gate. He told me #1 or #3, so I walked to those platforms and waited for the next bus. I must have waited for 15 minutes before I asked an Israeli (who spoke good English) if the bus I was waiting for indeed went to Damascus Gate, and he told me that it was somewhere else, outside the bus station; the bus I was waiting for would take me to a different city. Ay yi yi. Eventually I found the intracity buses, and waited at station 3 for bus number 3. The bus driver initially told me I was on the wrong bus, before changing his mind. Whatever, I thought, it just added more to the adventure. The bus I was on did indeed head toward Damascus Gate, but its final destination was the Western Wall. And, it must have been right after synagogues dismissed, because I had never in my life seen so many Orthodox Jews in their traditional garb, with their tassles and curly hair. Again, adding more to the adventure. I got off the bus closest to Herod’s Gate, and walked through it thinking it was Damascus Gate. I stopped and turned around when I no longer saw any signs in English and Hebrew–at some point, it became completely Arabic. I continued walking around the city walls toward Damascus Gate, beyond the makeshift shops peddling everything from women’s underwear to soccer jerseys and children’s toys. Thankfully, no one stopped me to offer me something, presumably because I was toting all of my luggage with me. Once through the Damascus Gate, I had only a rough idea of where I was walking from studying the Old City maps in my Fodor’s book, and a few photos of the different stations of the Via Dolorosa. Basically, I was to head inward and hope for a sign pointing toward the Via Dolorosa, and after a while, I found one. Even better, I found a pizza shop at the corner where I turned off the main road, which became my much-needed supper after finding the convent. The convent was not hard to find after turning onto the Via Dolorosa. Finally, I had made it. After settling in, I knew the South African group was staying at a guest house very close to mine, so I walked there to meet up with them. They invited me to come with them this morning to the Mt. of Olives, and since I had no plans for my Sunday, I thought this sounded like a great idea. The man at reception of the convent told me I had the best single room in all of the guest houses. I’m not sure about that–I’ll take his word for it–but I definitely have the single room closest to the temple mount, and the Dome of the Rock. Their call to prayer was very loud and woke me up at 3:45 am. I was able to sleep for a little while longer after using my iPod to drown out the Arabic chanting over a big loudspeaker, but finally couldn’t take it anymore and got up for good at 5:30. I also partially blame the dig schedule for my willingness to wake up so early! The view from my room: that’s the Dome of the Rock mosque right there! Once up, I had a good conversation with Judy, a nurse from Arizona who is also digging at Hazor. She is doing so to cross it off her bucket list. Isn’t that crazy/awesome? I recommended the convent to her and I think she genuinely enjoyed it here. I’ll see her again when I head back to Hazor to see their progress. Breakfast was a nice change of pace from the tuna and vegetables to which I’d grown accustomed at the tel. There was a lot of good fruit, pita bread, jellies, chopped hard boiled eggs, and cereals, so hopefully I won’t also grow tired of this breakfast too. I cleaned up and showered before leaving at 8:30 for the Mt. of Olives. 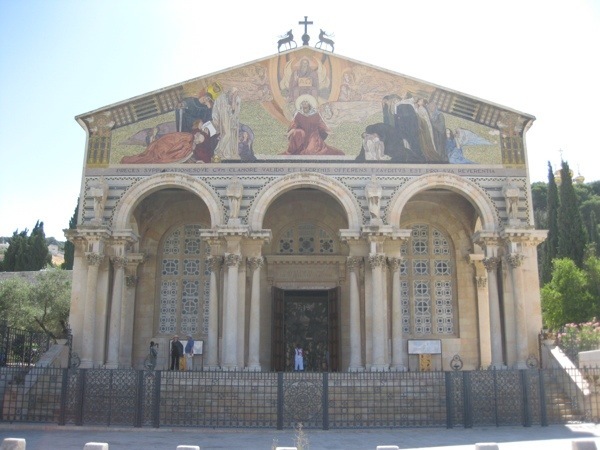 Our first destination was the garden and church of Gethsemane at its foothills, commemorating the place where Jesus was apprehended at his betrayal and prayed in agony for his followers. It is important to remember that this, and many of the other overtly religious sites, may easily not be the exact location of the events that they commemorate. Instead, they are memorials, inexact locations. The desire to say that we are standing on the exact spot where this-and-this happened… is somewhat baffling to me in the first place. Do we worship stones and trees, or do we worship God through the power of our defining stories? 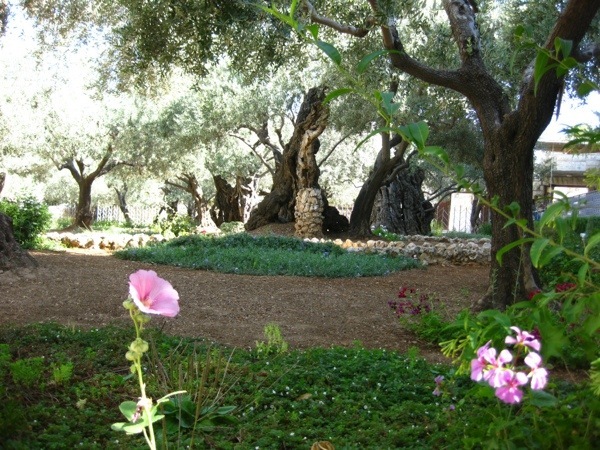 A garden, but not necessarily the garden, at Gethsemane. Recall that plenty more photos from my journey are available on my Flickr Photostream! 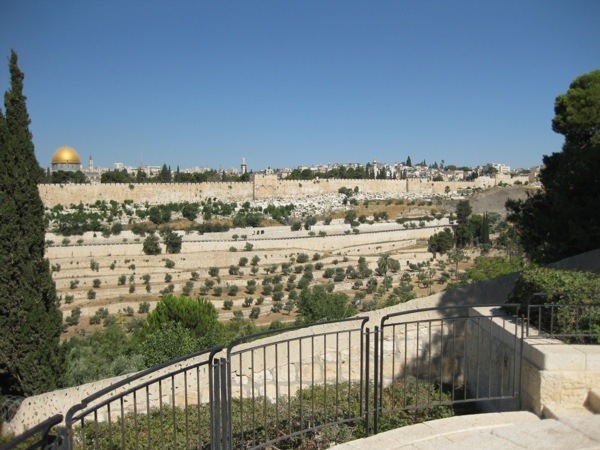 After visiting this garden and church, we ascended up the mount toward another memorial site, this time commemorating the story of Jesus looking over Jerusalem in agony for the city. I took a group photo here for the South Africans, and one of them got a good one of me as well. 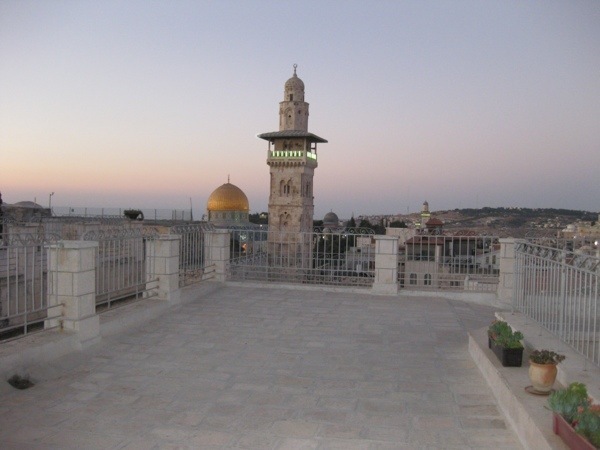 The ubiquitous Dome of the Rock, next to the dome of the Rob. From here, we walked some distance to the City of David, intent on seeing the archaeological progress here and wading through Hezekiah’s Tunnel. Thankfully, as has been the case for most of the archaeological sites we’ve visited around Israel, we got in for free by virtue of digging during the current season at Hazor! Hezekiah’s Tunnel was built in the period of panic following Assyria’s ascent as a world power. 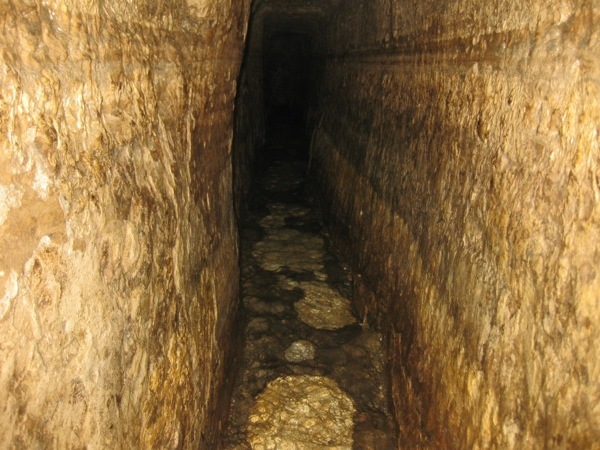 After it had overrun Hazor in the north and headed south toward Judah, the people of Jerusalem raced against time to divert its water source, which sat outside the city walls and could have been cut off militarily from the city, inside the city walls through this tunnel. One team began digging from inside the city, and another at the water source, and they zigzagged around before finally, miraculously, meeting up somewhere in the middle to save the city’s certain fate. Walking the tunnel was fun: at some points, the water level was about halfway up my thigh, but for the most part, it was just above my ankles. The water was chilly, and the tunnel dark, and I used a flashlight on my iPhone to lead the way. Actually, the best part about this was that the app also had a compass on its interface, so I was able to see quite clearly how inexact a science the digging of the tunnel was. It’s definitely not a straight line! The tunnel is not really much to see in photographs, illuminated as it is by my flash here. But, it was one of the highlights of the day. 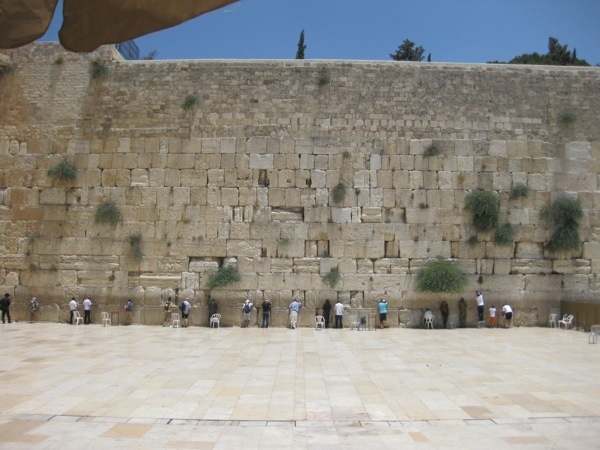 After a good deal more walking around Jerusalem and visiting some interesting archaeological sites related to the Roman destruction of the city in 70 CE, we ended up at the Western Wall. We didn’t go down to it, as we were just passing by. I think I may return here later during my stay in Jerusalem, as there is an interesting museum next to the wall that shows the depth of the architecture of the structure. Observant Jews pray and read Torah at the Western Wall of the temple mount. With that, the day pretty much came to a close. One last note, however. I’m not sure how vociferously I complained so far about the coffee at the kibbutz and at the tel, but it was atrocious. It was basically coffee-flavored mud, and it was so bad that it drove me to drinking hot tea… I never drink hot tea. Anyway, this story has a happy ending, because this afternoon I found a great Austrian coffee house not far from my guest house! I would rate the iced coffee/frappaccino situation I drank today better than Starbucks… unfortunately, it’s at Starbucks prices: 19 shekels, or roughly $5. Totally worth it, though. Rob, Was it dark when you were trying to find your way to the convent? You always write such a great blog with wonderful details and explanations. Love the pictures with the blog to help visualize what you saw. Glad you found good coffee too, I know you were very unhappy about the coffee at the dig. Yes, it was very dark, I got off the bus at Damascus Gate at 9:45. But, most places in the Old City are well let, so that wasn’t necessarily a problem. It would have been nice if it was daytime out while I was riding into Jerusalem on the bus, so I could have had a better view of the city and its walls from afar. Would it have been better to go to Jerusalem during the daylight? You did have quite the adventure – maybe more than you wanted? Thank you God for helping Rob through that nerve racking experience. Hope you can find some ear plugs so you can sleep a little later this week. You are in my prayers and thoughts constantly! All very interesting. Sounds like you had quite the day. I am thinking you may have to write a book about all if this someday! Will anxiously wait for your next blog. Stay safe! Thanks Aunt Gwynne. Yes, a very busy day, and we’ll see about the book!